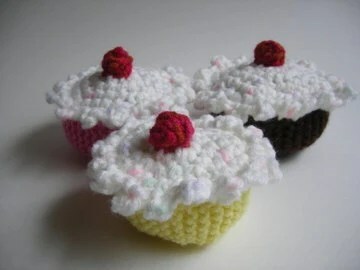 Ever since I opened my Etsy shop, I’ve been combing the Internet for ideas on how to market my shop for free. I’m not ready to put some cold hard cash into marketing just yet, although this may change in the future. I think there are plenty of creative ways to promote your shop without shelling out any dough. Although this option is not quite free, if you play your cards right, you can get free products and pay only for shipping. I put my shop’s website address and my contact info on the front. I did not yet have this blog or my Facebook page when I first ordered these so I write that information on the back. When I send out an order, I include a few cards for the buyer to share with others. I have my blog set up to automatically post my blog entries to both of these social media sites. I must admit that I don’t often get a chance to update each of these sites individually which is something I’d like to do more often. I’m still trying to get a hang of the best way to use Facebook to promote my Etsy shop. 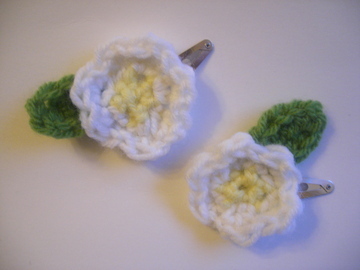 There is an Etsy application that you can use on Facebook which displays your new listings. I’m still trying to figure out Twitter and how to best utilize this tool. Back in May, I tried listing one new item per week, and then renewing listings so that I had a new listing everyday. By using Craftopolis, it makes this task easier and I find that with the updated listing tool on Etsy, it is all that much quicker to list new items. So what do you to promote your Etsy shop that has worked well with you. 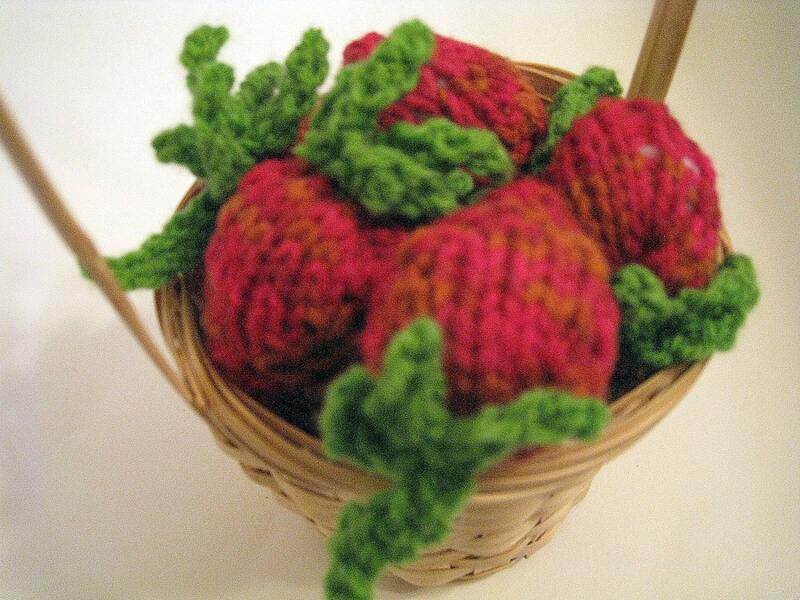 When we moved in to our house, there was a small patch of strawberries growing in the garden against the garage. Unfortunately, there were a couple of large trees in our neighbour’s yard overshadowing the little garden patch, so after trying to grow vegetables in that area, I finally gave up and decided to go the container gardening route and let the strawberries go wild. Well, after 6 years, the small patch now spans the width of our one car garage. 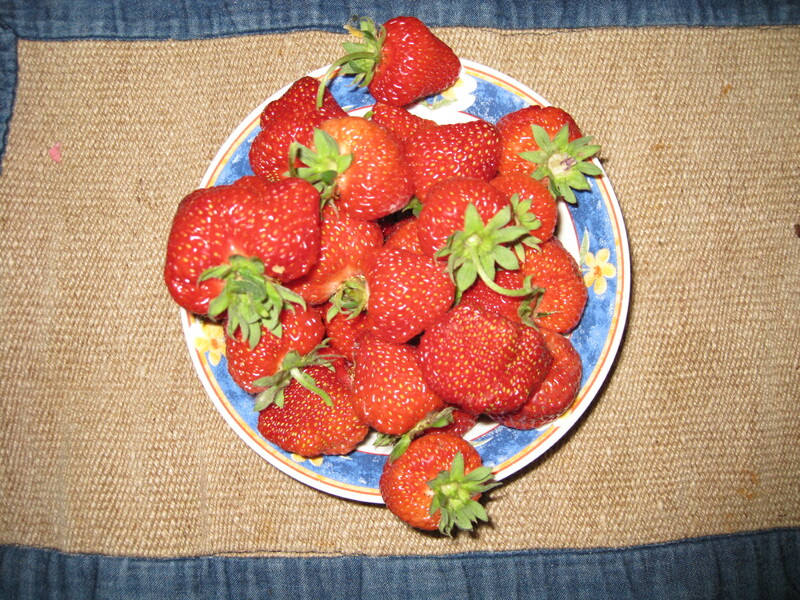 This week, I picked one large bowlful of strawberries every day. You can’t find anything more local than your own backyard. 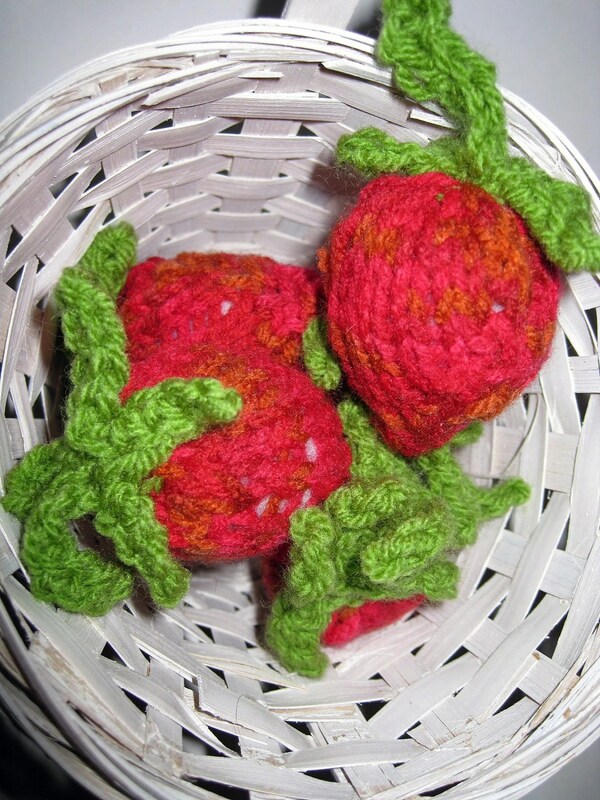 As an ode to my plentiful strawberry patch that has made my children and me quite happy this week, I knit up a set of toy strawberries with crocheted calix. Here are photos of the real thing and the not so real ones. 😉 Can you tell the difference? Mention that you saw this on my blog and I’ll ship it to you for free. You still have time to complete this project before Father’s Day as a gift for your dad. Really! I was inspired by men’s rugby striped sweater to create this cozy. This cozy is knit in the round on four 5 mm double pointed needles so you don’t need to stitch any seams. It is also a great way to use up leftover yarn. 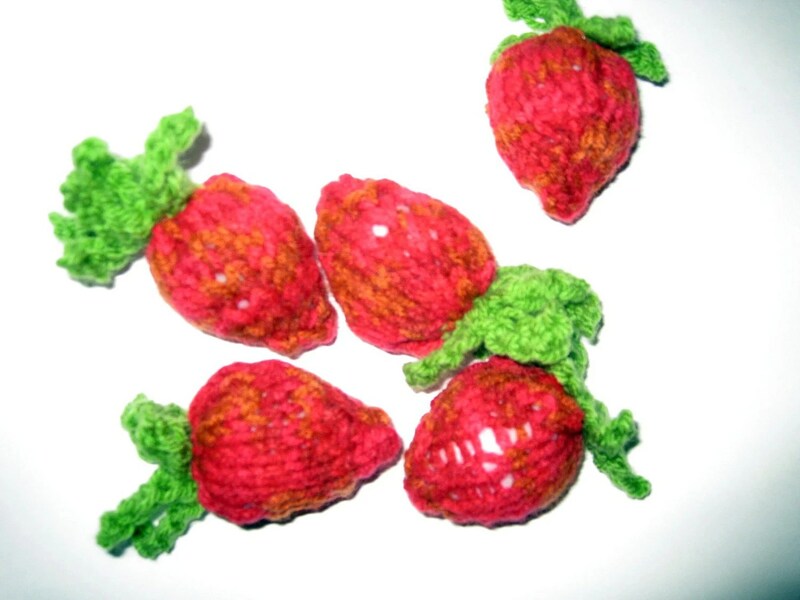 You can use any type of acrylic yarn such as Red Heart or Bernat. Cast on 33 stitches (in your prefered method) and evenly divide these stitches on three needles (11 stitches per needle). 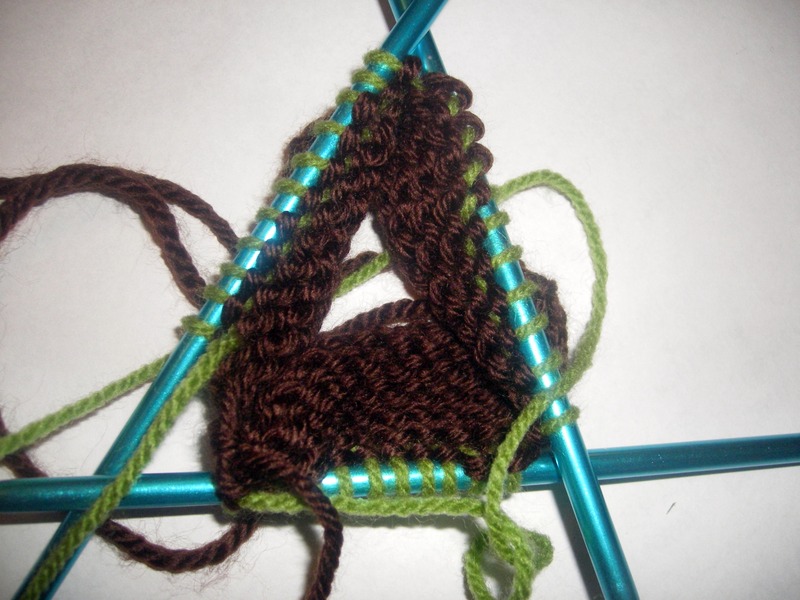 I like long tail cast on because it makes the stitches stretchier. Knit 5 rows of your first colour. 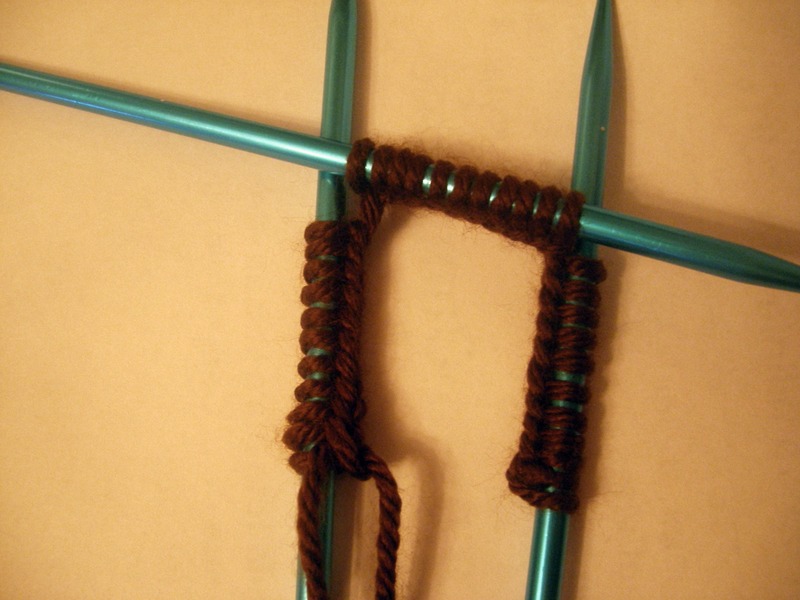 Make sure that there is no gap between the needles by pulling your yarn tight between needles. Knit 5 rows of your second colour. Repeat these two last rows until you have three stripes in the first colour and two stripes in the second colour. Once you’ve completed the five stripes, cast off. Weave in the ends. Voilà! There you have it! 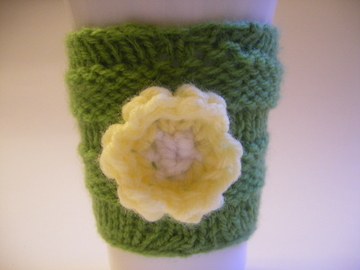 A cup cozy! When changing colours, I just carried the yarn across. If you decide to do that too, be mindful that you don’t pull the yarn too tight because it will make your stitches look gathered. 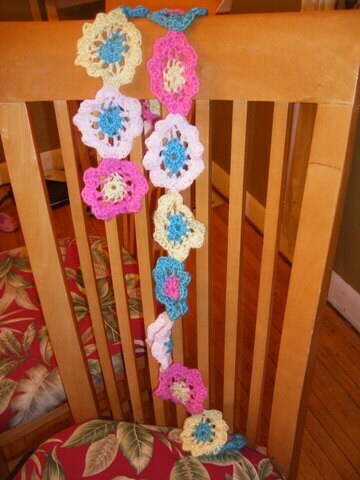 You can also cut the yarn between rows to make it look neater…it’s up to you. 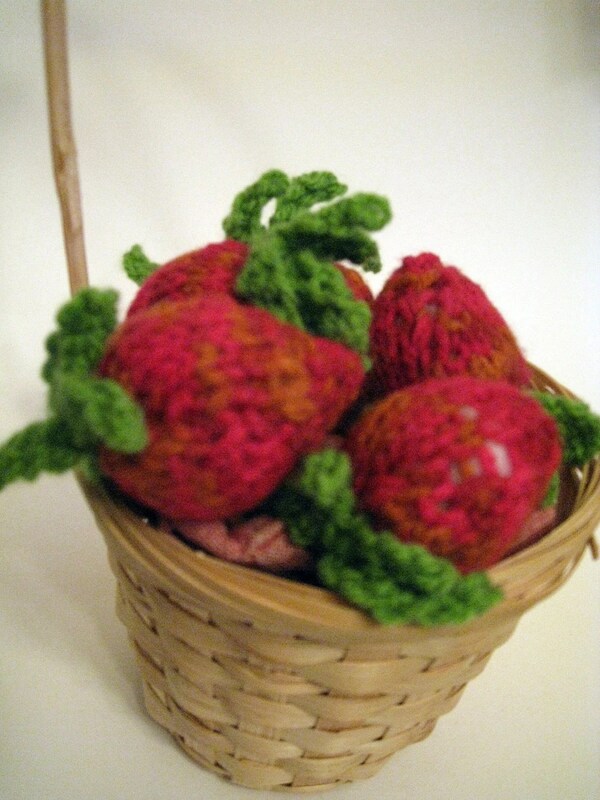 I wanted to make something quick and easy without lots of loose ends to weave in. 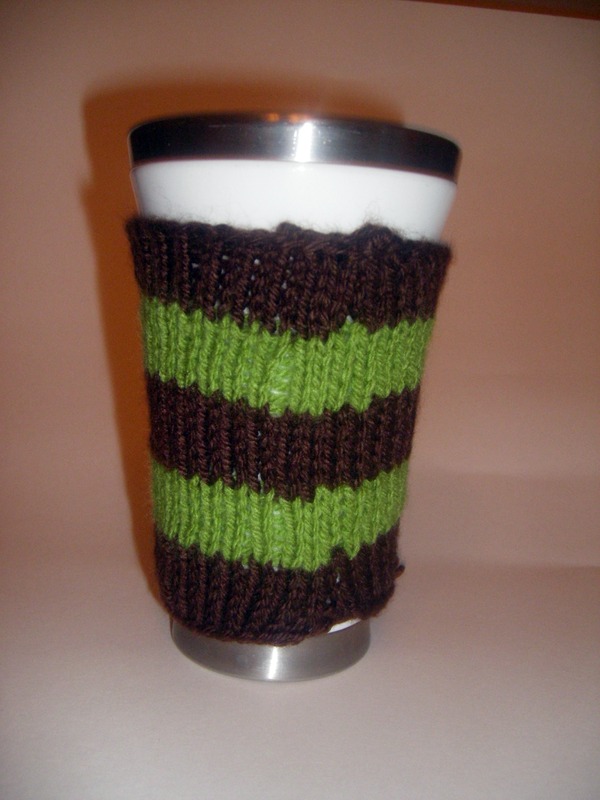 If you don’t have time to make this, this cozy is available for purchase on my Etsy site. 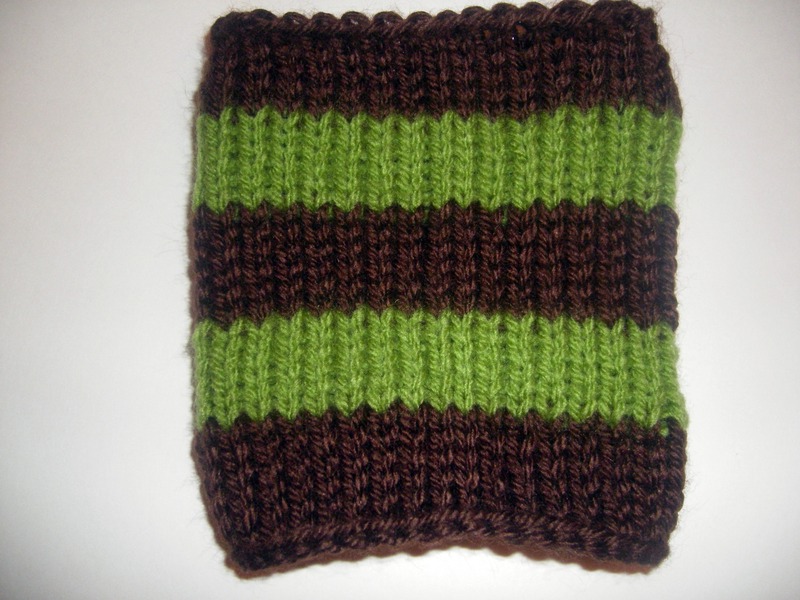 For some reason, it started out with a ribbed cup cozy…then, hairclips and then, a wristlet. 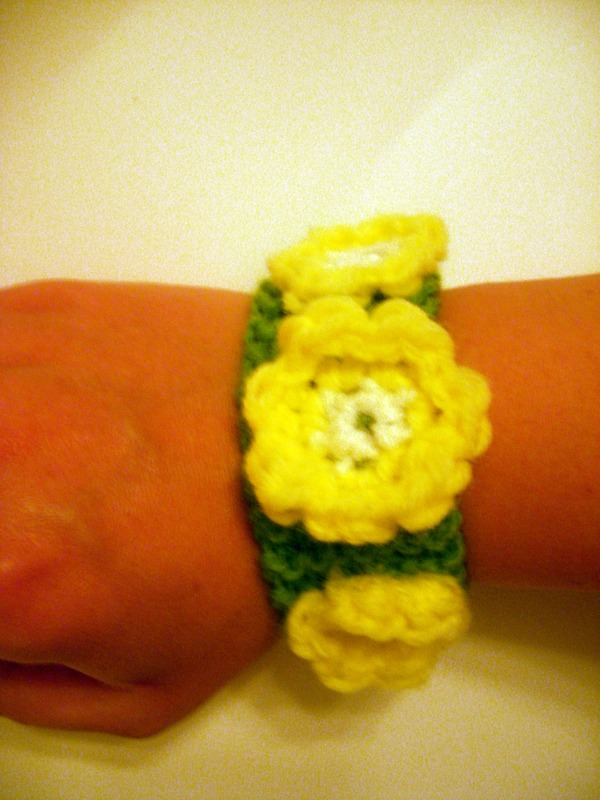 All knit in the same green yarn with crocheted yellow and white daisies. To quote Oprah, it was my “ah-ha” moment. So here it is, my exclusive daisypatch spring collection. These items are all available on my Etsy site. Then, I linked them by stitching them together on the corner of a petal, making sure that the right sides were facing out. At first, I wasn’t sure about the colour scheme but when I tried it on, it looked really cute. It turned out to be about 6 feet long!!! Click here to see the listing on Etsy. I made my first sale on Etsy!! !